The picture takes up almost the full height of the poster. In ad terms, this design is “product as hero,” best exemplified by bottle shots for upscale liquor. As befits a hero, he looks his handsome self. But this has been achieved at a cost. Close-up it is evident that the shot has been extensively retouched. The chin (the second one) has been faded away, and the hairline brought forward. 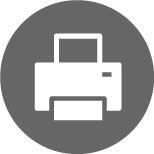 As the printing is also not very high-resolution, the end result is rather flat and lacking in character. His expression is neither smiling nor serious nor anything. He eyes do not quite meet ours. He looks a little worried. Although the face is the most dominant element in the poster, somehow he seems very far away. The propping is very conservative. He wears a plain white shirt, a tie in the party colors, and no insignia. The most striking and communicative element besides the face is the blazer with a party crest on the pocket. Now, blazers are rather rare in Thailand. They are worn mainly by officials, especially on the ritual occasions (anniversaries, royal celebrations, etc.) which are a significant part of their lives. The blazer presents Abhisit as belonging to the old bureaucrat culture. His pose is glacially still. In fact, this reflects the man. When he appears talking in public, his body is almost static with only his mouth moving, rather like a puppet. In old Thai culture, the ability to achieve this bodily stillness was considered positive, conveying self-control, self-effacement, and deference. He looks like an official waiting politely with body still and eyes slightly averted to receive a command. The background of a bright sky lends an upbeat tone to the poster, but also emphasizes the dark, heavy, static character of Abhisit himself. Although the overall design should present the leader as hero, the poster has been crowded with messages which rather ruin the effect. There is the party name in both Thai and English, a slogan (“move ahead with policies for the people”), a large order to ELECT, which seems superfluous, and two check-boxes which claim the Democrats will “really” implement their policies from day one. This shot is clearly considered a key part of the campaign as it is being used in other ways. It appears on another poster along with four key campaign pledges: increase in minimum wage; more anti-drug police; higher profit from the crop insurance scheme; and more student loans. With the shot now not crowded by copy, the blazer is even more prominent. The head part of the shot is also being dropped into candidate posters. 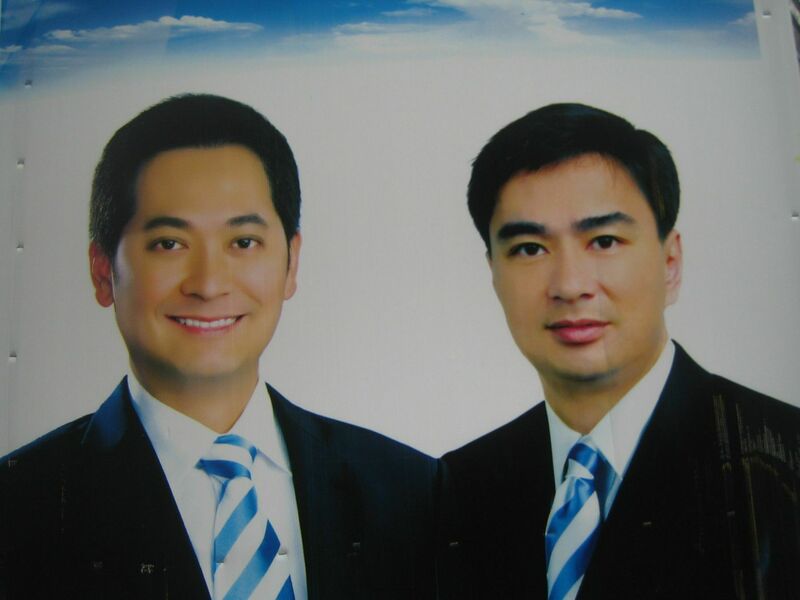 But so much detail is lost, that Abhisit looks almost one-dimensional and unbelievably young. Also his eyes seem even more reluctant to meet ours. I was just up in Khorat last weekend and every one of the Democrat Party posters on the highway were vandalized (usually Abhisit’s face being cut out). Love or hate the guy at least leave the poor posters alone. Seems the Dems learned more than just one trick from North Korea….. Hope they used a licenced version of Photoshop. This is the first time that we’ve had half-decent campaign posters. I think we can give the trend setter award to Yingluck. Part of the reason the posters look better this time is that they have actually been *less* retouched than usual. Normally they Photoshop the candidates faces until they look like ghouls. 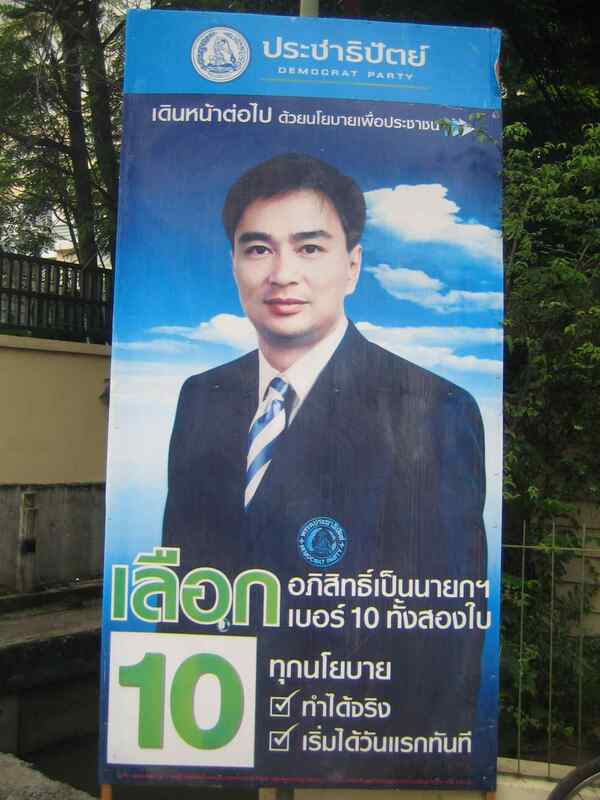 Wondering whether the vandalism of Abhisit’s face in election posters as noted above is a recent occurrence? To what extent did it happen in elections before the military coup and subsequent manipulations & interventions (including using the military to crush pro-democracy protesters)? The author is a Westerner, and is “reading” the image as a Westerner. I doubt that a Thai would read it this way. Why go to Korat to witness the widespread vandalizing of DP ele3ction posters? (#1). Just cruise Bangkok main roads (try South Sathorn all the way to Thonburi side) and most DP election posters will have Abhisit’s face cut out. I am guessing that many Red Shirts in Bangkok have just taken a strong fancy on the handsome Abhisit face they had to cut-off his photo as memento. I just hope those vandals do not get caught by the EC because if it turns out that those vandals were hired by any of the the Red Shirt/Peau Thai Party leadership, Thaksin’s political party could be outlawed, again for election rules violations. A sixth former still wearing the school blazer and tie, which, as commented on by CB, associates the wearer with the old bureaucracy. Looks like the Ds want to lose. I don’t know where Chris took those posters from but if you live in Bangkok, these are posters you will see. I applaud your righteous indignation at those defaced posters. I totally agree with you that such vandalism is very unbecoming of any educated or cultured person. Perhaps you can advised me on this dilemma: (my extended family is about half yellow and half red – so you can imagine the fights we are having) a distant cousin – pro PAD and ardent royalist – has been caught red-handed by his parents chatting with his friends online on how to pretend to be red-shirts vandalizing Democrat Party. They have been assured that being royalists they would not be charged for helping to discredit any party that is not the patriotic democrat party. The family’s solution is to ship the boy overseas until after the elections. What do you suggest the parents do? The anti-PAD from the North had been actively removing any advertising posters by Democrat Party or PAD for a while now – I believe with a vengence since it became clear that the PAD will be getting away with blockading the Airport and its leaders rewarded for so publicly breaking the law. I totally agree. Leave the posters alone, all sides should be allowed to campaign without fear or prejudice. But I do enjoy reading Chris’ comparatively harmless analysis of those posters. I wish all discussions within my extended family on the upcoming election could be equally harmlessly interesting and done with candor. My mom just removed a Thaksin printout thats being used as a dart-board. My aunt just removed an Ahbisit printout thats being used as a dart board in her house. What would these men do without wives, I wonder? If they photoshop Abhisit any “whiter” he’s going to be transparent. Wouldn’t it be more clever to actually make him “darker” so he looks more like a Thai person instead of a part-Vietnamese, Hakkanese Chinese person? A couple of my offbeat comments. Is this the Democrats counter to the PTP Yingluck poster? If so are they are just copying once again? As the government wouldn’t it be better to say Re-elect rather than elect or have the Democrats seeded the Re-elect word to the PTP as they never were actually elected. Increase minimum wage is just as wee hypocritical as they didn’t want to only a few months ago and when they did it amounted to a beer a month in some areas, like Phayao. And, pray tell, why would you need more student loans when the Democrats keep telling us that they have brought in 15 years of free education? Personally I see a desperate party that waited too long to call an election and their rivals who were in disarray a year ago have come full circle and reinvented themselves leaving the Democrats to try desperately to catch up. As a Bangkok Designer. I think it has been designed by Design Elements just by designer who think everything as an Object. Very good Typography especially those PRA-CHA-THI-PAT which re-designed from the older and out-of-date one by a very good design firm in Bangkok . But Overall design give us the same massages that he has got no Dimension, No Feeling, Far away and flat. Very interesting analyses of both Abhisit and Yingluck. So I’m hoping you can do some analyses of Chuwit – plenty of stuff there – and also Number 21 who looks a sweet and dorky guy. If I had a vote and any idea of what he was standing for, I’d be tempted. One thing that I have noticed since the last election is that there seem to be less of the photos that rely on uniforms and graduation suits and there seem to be a few more slight smiles and less stiffness. I am no ‘Dear Abby’ but I’ll oblige Nuomi (#9). (1) Parents should cease eavesdropping on their children’s facebook pals. (2) Time for Adult children to get jobs . . better than parents stupidly sending them off to nearby Cambodia to meet Arisman. (3) Extended family should stop sharing colored underwears et al. Anyone else with NM with love or family problems should write Walker or Farrelly instead. Seeing the Democrat posters in the north my first response was the faces cut out could be the work of his own party as the photo was a shocker….it presented the local candidate accompanied by a kind of sneering smirking Abhisit. 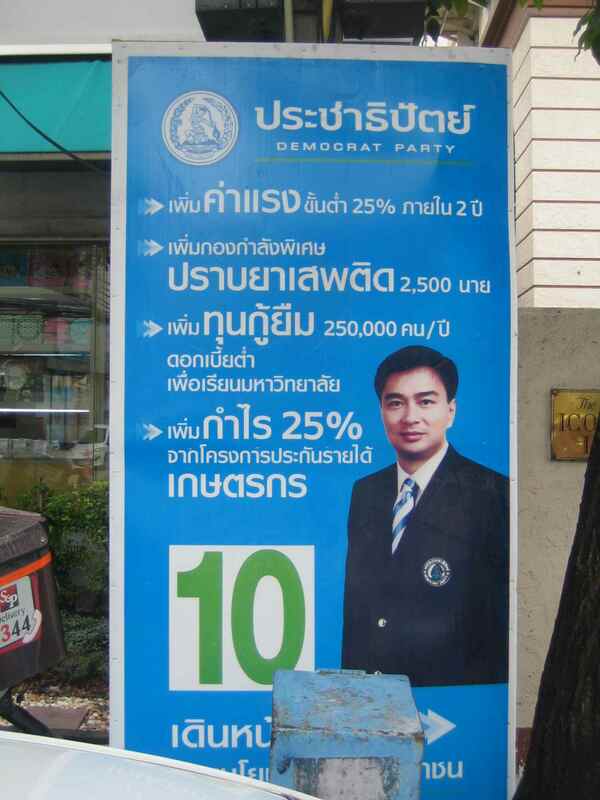 I’d love to see Chris Baker analyse the Chiang Mai variety of the Democrat posters – the face removing vandalisers could be doing the Democrats a favour because from what I’ve heard about them, ‘shifty’ should be added to SteveCM’s ‘sneering smirking’ description of Abhisit’s photo in them. Like to see Chris Baker give an analysis of Chuwit’s (No. 5) posters. they show more character that all the other candidates put together! I might just vote for him. By way of clarification, I post here and elsewhere as “SteveCM”. Previously, I posted on NM as “Steve” – until posts from another “Steve” appeared many months ago. From then on, to avoid confusion, I added the “CM” and explained as much at the time. I didn’t write the “Steve of Chiang Mai” comment and I’ve no idea who did. 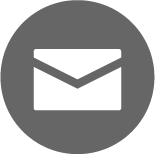 Perhaps AW/NF might be able to check the e-mail address of that post? As it happens, my subjective reaction to the first clutch of Abhisit placards I saw in Chiang Mai didn’t and still doesn’t include “sneering smirking” or “shifty”. Rather, they struck me as making him look distinctly awkward and distant – and actually just plain unattractive as a person (compared to other previous images of him and what could have been achieved). Any one of those factors is enough to raise the question of just how the Dem marketing team could have got it so badly wrong – without even moving on to considering the other “s” adjectives. Like (but probably less than) Chris, I have some background in advertising/PR – mainly in commercials and corporate video. To put it bluntly, in my experience any team allowing the client to look that awkward/distant/unattractive would have been fired – and rightly so. For whatever reason, the “Mark 2” image is strikingly bland and de-humanised – and anything but appealing. For that blunder, if I were in charge, they’d be fired too. Fortunately, I’m not and – given my low opinion of Abhisit & Co – I rather hope they’ll continue with their novel “truth in advertising” experiment right up to 3rd July. Anyone see the code of number “25” on the Dem’s pledges? 25% wage raises, 250k Bt. of student loan, 2.5k additional officers on drug war, and 25% increase of profit on crops price. Isn’t “84” an auspicious number for this year? I noted your article with interest. I must say I disagree. The Democrat ‘poster’ does not work in any marketing strategy. It tries to fit too much information into one small poster. It says too much. The picture is unrealistic, seemingly obvious that Abhisit is superimposed on a picture of a train. To me, this poster, with good intentions, shows exactly the nature of how the Democrat has run the country in the last 3 years. It tries too hard, and doesn’t deliver; its not simple and direct, which is the message that a poster should be. Also PT has election posters stating their promises, those usually are writings with a small picture (without any candidate) on top. It’s also been the governing style of mrT, to do, act, fast, direct. Comparing the introduction of Yingluck to a detailed Democrat poster is unfair and selective. If marketing strategies are microcosms of how they run the country, and if Democrats can’t even set a proper marketing strategy with target audiences in mind, well… then how can they run the country? It’s all a joke, I’m laughing 55555555 get it? So to counter Yingluck’s picture portrait, the Dems come up with another copycat version, one that makes Abhisit look monotonous and redundant! I myself am voting #5, proudly, and as for the MP leave it blank or go for PUI THAI just to show my frustration at the ELITE! or maybe I will vote #1 for both sheets since my whole family is going #5!! Simpkins (#21) should be congratulated for his very good riposte to Somtow why he would NOT vote for Abhisit’s party (No. 10 in the ballots). But then from the cerebral, Simpkins reverses to the instinctive . . . and like SteveCM will now proudly vote with his dickie for No. 5, the pimp Chuvit. Attaboy Dickie and SteveCM . . . for eloquently elucidating ‘at length’ both your . . . ahem . . . preferences. Sorry – didnt mean to cause confusion I use the name “Steve of Chiang Mai” on other blogs…mainly EPL and the name comes up automatically on Google Chrome . Your subjective first impression and mine are not the same but I dont disagree with your insight on reflection either. However we seem to be agreed on one thing – they are decidedly poor efforts from a marketing perspective. This election is the first time I have seen widespread vandalisation of election posters. In my area, it’s Bhumjai and the “Animal” posters that seem to have suffered most. As you brought up Somtow, I have many if not all of his books, it came to me as a shock he was so “mind-violently” for the yellows as his blog demonstrates. Ok his books on afterthought were clearly elitist, that was nice as in fiction (like the subway under sukhumvit for the rich ones), but IRL… Was it on bkk post or nation where his hate-amsterdam editorial appeared ? Whatever picture of Apisit, the guy always looks tricky—someone not to be trusted.